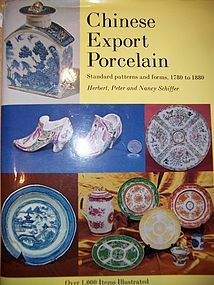 A very good reference book that covers various Chinese export wares, but which is especially useful for Chinese Rose Medallion collectors. While the book is somewhat lacking in that most of the photos are black and white and not in color, the book is still very important as an encyclopedic guide to all the myriad of shapes and forms within the Rose Medallion genre. From standard vases and bowls to the more obscure shapes like marmites, sponge dishes, and bulb trays, this book has virtually every form ever produced. In our candid opinion, it's not enough of a reason to purchase an antique merely for the sake of a free book, but any client already seriously contemplating a purchase can enjoy this as a free extra. Many collectors, especially beginners, do not make enough effort to acquire good reference books, and are tempted to spend on pieces before they have really learned enough to purchase responsibly and protect themselves. But there is really no better way to educate one's eye than studying the pieces of established collections in published books. However you acquire them, we encourage collectors to amass a good reference library which over time, is essential to building a solid collection and avoiding costly mistakes.